Childhood memories: Tommy Hunt admires an Indy Car model that he built for his dad, Joe Hunt. Spotlight | Rust Magazine had a chance to sit down with Tommy Hunt in his memento-filled office in Roseville. Tommy, the son of legendary magneto king Joe Hunt, has spent his whole life in the world of racing, aside from a short stint playing minor-league baseball for the Cleveland Indians. For 11 years Hunt, 71, has been the race promotor of Calistoga Speedway, the oldest dirt track on the West Coast. He started out working for his dad, Joe, who ran race cars. Tommy worked in the magneto shop and as a race mechanic. He spent time at Drake Engineering getting parts for his dad’s engines, and he got to see Leo Goosen. Many of the big-name drivers of the 1950s and ’60s drove Joe Hunt’s cars, including Jim Hurtabise, Garry and Merle Bettenhausen, Carl Williams, Joe Leonard, Al and Bobby Unser, Johnny Parsons and Johnny Parsons Jr., Ralph Ligouri and many more. Joe Hunt had been a civilian aircraft mechanic working in Ireland for the Air Corps during World War II. Postwar, he took the Bendix SF-4 magneto used on aero engines and adapted it to, among others, the Offenhauser racing engine. In 1950, Johnny Parsons won the Indy 500 using a Hunt Magneto. Hunt Magnetos were on Indy-winning cars for many years, and Tommy was there, helping his dad. In 1978, Tommy Hunt left his dad’s shop and came to Sacramento to work for Don Tognotti selling race equipment. When his father became too sick to run the company, Tommy bought Hunt Magnetos from his parents and ran it himself until 1986. He sold the company to two of his employees and went to work at USAC working for, among others, Roger McCluskey. He stayed for 26 years. Over the course of his career, Tommy raced sprint cars, and midgets. His son Tony is a 10-time USAC sprint car champion. Tommy is a huge Steelers fan and a huge Doors fan. But mostly he is a student of racing. A student of racing history, the promotion of it, the technical aspects of it, drivers, tracks, cars: You name it, he has insight into it. And Hunt is not shy about what he thinks. There are very few people with as broad a view of the American racing scene. Not many have experience with as many of its aspects (racer, race car owner, equipment manufacturer, equipment sales, sanctioning body and race promotor) as Tommy Hunt. Tommy Hunt: I promote Calistoga Speedway and I’ve done it since 2008. So next year will be the 12th annual Louie Vermeil Classic. We will do two Outlaw shows next year. We will do one in March and one in September. (Ed. The March show has been canceled due to scheduling issues) We do a King of The West show on the same weekend as the NASCAR weekend at Sonoma, which is June 22nd. At this point I’m not sure what else I am going to do. Rust: You run the motorcycles, too. Hunt: Well we run the motorcycles and I’d like to run the motorcycles again. There is going to be a provision for the March race. But the bottom line is, there will be a contract. … The way Jim France has structured it now, it’s kind of crazy. I love the [motorcycles]. Gene Romero is a very dear old friend of mine. I’m a sprint car racer, but if the engine fires up I’m pretty much in. The track last year was probably the best track they ran all year long. You know, it’s a half-mile race track and it’s a real half-mile. Pierson, that comes in and does the race track, he just did a hell of a job. Thing was, he actually overdid it. It wasn’t bad. They’ve had a lot of problems with race tracks and race track surfaces, specifically injuries. What’s happening? Is the surface coming apart? Hunt: Basically, what you have to work with is sand. So in order to constitute a race track out of that, over and above putting a lot of calcium chloride or calcium magnesium, or whatever that it requires to compact whatever you got, it is almost impossible to compact. USAC sprint cars roar down the front straight at the start of the 2016 Louis Vermeil Classic at Calistoga Speedway. In operation since 1938, the dirt track is the oldest on the West Coast. That’s a pretty common problem today. Because of the environmental issues that we’re dealing with they get really bumpy about the calcium chloride even though it’s one element away from salt. It’s tough to constitute a good surface without clay. In a lot of these facilities the horse people have done everything they could to get rid of the clay. Because they want it soft. You have done a lot of improvements at Calistoga. The speedway itself has gone through a lot of changes in the last 15 years. Hunt: Yeah. That race track has a NASCAR-type catch fence all the way around it. Were you part of that restoration? The everyday person going to Calistoga, they don’t expect a race track there. 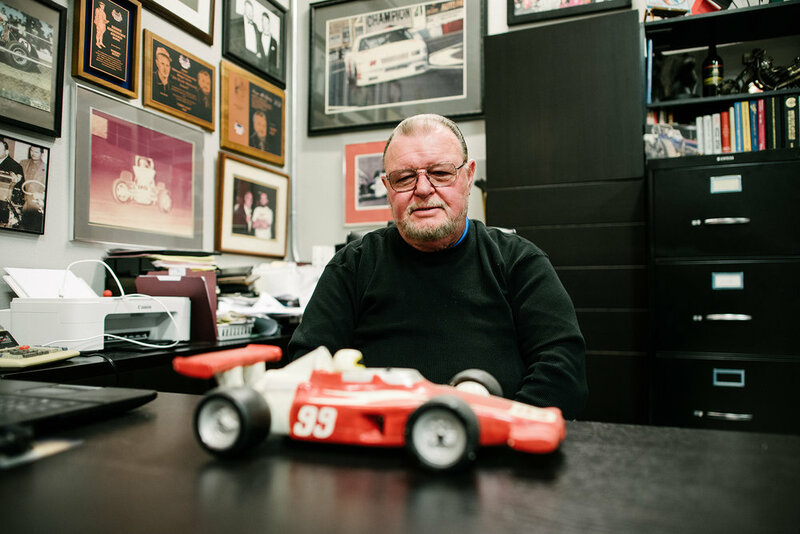 Hunt’s Roseville office is filled with mementos chronicling his family’s life in motorsports. We did not have one person show up with a negative comment. Not one. Much more support than you would think. There is no question that there is a little bit of a traffic situation that occurs because there is a big input of people into town. There is no doubt that there is a little bit of a noise situation. Although it’s 95 [decibels] at 100 feet and it’s monitored. How far out do you think you can do it? How much of a lease do you have? HUNT. I’m going to secure a five-year lease. I can potentially see it going another five years past that. But I don’t know. I feel pretty good about five years. If you look at racing in general right now and you look at the automotive industry … there’s reason to believe things could be changing pretty dramatically pretty soon. We are on the cusp of massive changes. Hunt: Which is both good and bad. You know, it is what it is. What do you think philosophically about racing and where we are as a culture? Hunt: Well, what I think I wouldn’t want published. The bottom line is I fear that we have some issues. And some of them are not solvable. My base crowd, I think 77 point something percent of my crowd, is 55 and above. Over 70 percent of that crowd comes from the 707 area code, which is Napa, Sonoma, St. Helena, Calistoga and Santa Rosa. There is a convenience level for that. Obviously they’re close. That’s really important because in Calistoga on Labor Day weekend you’re gonna pay $300, bare minimum, for a room. So you have some issues that you have to deal with. Hunt: I was still working for USAC in 2008 when I started. It made really good money then. It’s got to the point now where it’s … they’re going to have to give me some room because it hasn’t been good the last couple years. The crowd is decent but it’s just so costly to do business over there. Terrible cost. It costs $12,000 a day to rent the facility so that’s $24,000 in two days. I could rent any facility in the State of California for a third of that. What was your inspiration when you first decided to get Calistoga Speedway back on the map again? What do you remember about Louie Vermeil? Well, Louie saw him do that. And he came over there and says, “Hey, let me see that.” And it was a real late number, which was really bad at that time at Calistoga cause they had 40, 50 cars. It was big. So, Louie reaches in the bingo thing and pulled a number that was like 11 or 12 and gives it to me and he says, “Here, use this one.” And he was really pissed at the guy who did that. Hunt paused to point out some of the photographs on his wall. The cars range in age from the 1940s big cars to modern open-wheel, sprint and stock cars. Many of them were owned or sponsored by his father or raced by himself or his son. Hunt: He was kind of an innovative guy. He actually worked as a civilian for the Air Force in Ireland. I don’t know how that worked. That supplanted his draft responsibilities. When he was in Ireland some of the airplanes utilized this SF-4 magneto. When he came back he built a modified version of that for the Offy. In 1950, Johnny Parsons won the [Indianapolis 500] race with the mag, and that was the first race we won. After that we won all of them for, I don’t know how many years. My dad’s roadster was built by Ronnie Ward and Wayne Ewing. There were two cars that were built off of Watson’s prints that year. They were endorsed by Watson because he didn’t have, he couldn’t build enough cars. They built the Dean Van Lines car, which sat on the pole that year, and my dad’s car. They were really nice roadsters. Hunt is very interested in racing technology and engines. As a promoter, clearly he wants to have as many race cars in the show as he can. He feels that the cost of engines is limiting participation in, and the growth of, sprint car and midget racing. Looking at one of his father’s early cars, Hunt began to ruminate on the design and cost of the racing engines of the past vs. current engines. Hunt: It is amazing how smart those people were back then. They were certainly a lot smarter than we are. I can tell you that. You figure that most of the racing that’s taking place right now, both midgets and sprint cars, is done with pushrod engines. Well, so, in the midget category especially, because of the harmonics that you suffer with that four-cylinder, it’s like a dog trying to shed peach seeds. You know, you change valve springs after every race. A display of 100-plus Indy car die casts line a wall. Now with the midgets you have a $60,000 midget engine that runs eight races and has a $16,000 overhaul and you change valve springs every week. For a car that costs every bit as much as a sprint car and you run for less money. That was one of the cool things about midgets. You had an Elko, a V-8 60, a small Offy. Hunt: Yeah, now Toyota pretty much, they have the dominant piece. It’s a complete racing motor. All aluminum, built specifically to do what it does. But you know, your 166-cubic-inch pushrod engine that’s developing 370-plus horsepower? No torque because they’re running so much camshaft in it in order to get the power. So it’s an engine that you have to keep on the cam all the time. It’s been very successful. Esslinger has a single-overhead cam; now Stanton, which is more or less a MOPAR thing, has a single-overhead cam version. Which has been successful. My problem with it is: You can go to Summit and you can put $9,000 on the counter and you can get a 2.4 liter Ford Focus-oriented engine with twin turbochargers on it that will make 370 horsepower and 350 pounds of torque. And these people are paying $60,000 for a pushrod motor. We put an LS motor in Tony’s car that a guy named Schwanke developed in Minnesota. He won 11 races with it. Cost $16,000 and was running against the $60,000 motors. It cost $16,000, guaranteed 30 races and the overhaul was under 2,000 bucks. And they hated me. They hated me. And they hated him. He won 31 races before that so it wasn’t like he was gonna stop winning races. It took us a year to figure the thing out. But great, great things. Had an electric fuel pump in the tank. So the safety thing was great. Mercury switch so if it tips over it shuts off the fuel. The engine was a single throttle body. So basically you have a single cable going to the throttle body instead of trying to balance all the butterflies with two crossover pieces. It was just so simple. Made 650 horsepower. But it made 600 foot pounds of torque for 4,000 RPM. The open motors we were running against were making 760, 780 horsepower, but they couldn’t compare with that torque. Hunt: Well they just … the engine builders hated it. For obvious reasons. A lot of the people that were purists, for them to tell me that I didn’t understand. … I have nothing against (engine builders); they did what they were expected to do. They did it because people wanted that. The only thing is, I have to have enough people to run races. And at some point when you look at the income capabilities of people and what they have for disposable income. I mean, it’s gonna kill itself. There is no question in my mind. It’s never been to this level. They can say whatever they want about the cost of an Offy at the time. You can’t justify it. It’s way over the top. It seems like it would keep the sport from growing. Hunt: I think it’s in trouble. I think it’s in even bigger trouble because we don’t have young people. I don’t know who’s going to take up the slack at this point. I’m 71; I just thank the good Lord that I had the opportunity to be around and see the things that I did. That was a gift. And it’s never gonna happen again. I apologize for being negative. … I would be so honored and so fulfilled in my life if I was able to do something that I thought was helping to preserve the sport.